The enhanced Bobcat 200 Air Pak is a quiet, fuel-efficient all-in-one that maintains power capabilities in a compact, lightweight footprint and is backed by industry-leading reliability and performance. 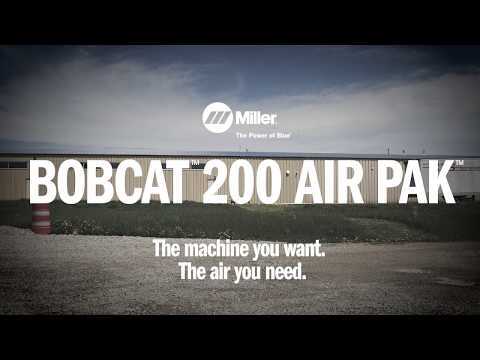 The Bobcat 200 Air Pak provides 20 cfm of compressed air at idle or 30 cfm at full speed. The industrial rotary-screw air compressor easily outperforms and outlasts reciprocating compressors. The Bobcat 200 Air Pak provides up to 100 amps of DC power to quickly charge 12- and 24-volt batteries. Jobsite equipment with weak batteries can get up to 300 amps of crank assist from the Bobcat 200 Air Pak. Electrical tools, lights and more. The Bobcat 200 Air Pak can power most jobsite electrical needs with its 6,500-watt generator. The Bobcat 200 Air Pak can easily handle metal repairs with its 210 amp inverter-based welder that is capable of stick, DC TIG and MIG. Advanced Auto-Speed technology automatically adjusts engine speed to match weld and battery charge demands — reducing fuel consumption, maintenance costs and noise for a safer, more efficient jobsite. This all-in-one can replace a variety of other machines, reducing a work truck's weight and increasing its available payload - so operators can bring everything they need to the jobsite. The Bobcat 200 Air Pak can meet operator needs for compressed air, electrical power and welding capabilities - all while the work truck's engine is turned off. Highly efficient without sacrificing power, the engine in the Bobcat 200 Air Pak uses far less fuel than any work truck's engine, delivering savings on fuel costs that quickly add up. Turning off a work truck and turning on the Bobcat 200 Air Pak can reduce the truck engine's idle time by up to 75 percent. Less engine idle time means maintenance is required less often - so overall maintenance costs are reduced. Ruggedly built and rigorously tested to ANSI and CSA standards, the Bobcat 200 Air Pak is proven to withstand high temperatures, rain, salt, dust, impact, vibration and more. Its systems are tested to meet the highest-applicable industry safety standards. An air dryer system that eliminates moisture in the air stream to prevent air tool freeze-ups in cold climates. Ensures good air quality in all climates. For use with EnPak A28, EnPak A30, Bobcat and Trailblazer Air Pak products in cold weather applications. Includes two heavy-duty 15-inch tires, two 8-inch rubber swivel casters and a heavy duty handle. Recommended for all surfaces and applications and is easy to move around the jobsite. Protective cover for Bobcat™ 200 Air Pak™ without running gear and EnPak™ A28. For work truck fleet managers looking to keep idle time off of their class 3 to 5 trucks, EnPak A30 is the quietest and most fuel-efficient All-In-One that maintains PTO driven power capabilities, including 12V DC, in a compact, lightweight solution backed by industry leading reliability and performance expected from Miller.